Do you have ancestry in the Beenleigh area? 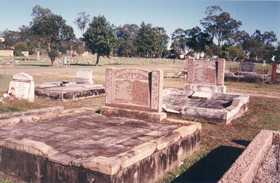 Established in 1872, Beenleigh Cemetery is located in River Hills Road, Beenleigh, Queensland. It covers burials from establishment to the current time (there is one inscription recording a death date of 1867). The initial transcript of Beenleigh Cemetery was made between October and December 2000, with final checking done in April 2001. It's a terrific genealogy tool for anyone exploring their family history or building a family tree.